The first real piece of DLC has been released for the excellent Deus Ex: Human Revolution -- weapons and skins don't count -- and at a bit of a hefty price. Like Mass Effect 2: Lair of the Shadow Broker, The Missing Link adds some new action that fits into the game's universe, while offering you a lot of what you've seen before. The question most fans will ask themselves, however, is whether or not it is good enough. The Missing Link expands upon Human Revolution's story at a point where it seemed like nothing was actually missed, let alone a link. 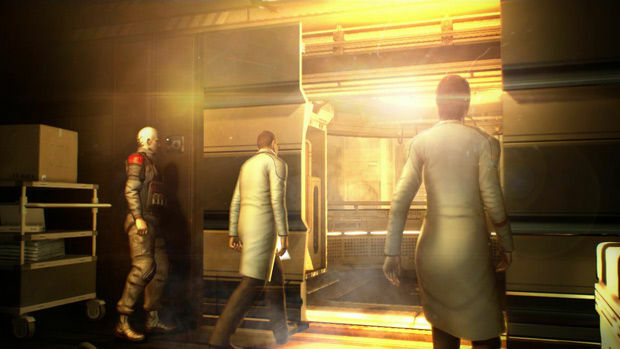 As Adam Jensen departs Heng Sha in a cryostasis chamber on board a freighter, the original game simply had him wake up at his planned destination some time later. In The Missing Link, however, Jensen is rudely awakened on board the Belltower cargo ship he hitched a ride on, finding himself in a bit of a predicament without access to his augmentation upgrades and weapons. Rather than having to have a save game at the ready to access the DLC, you simply start it from the main menu's Downloadable Content section. This makes it feel slightly disconnected from the main story, but it's a better solution than having to replay the entire game up to a certain point just because you didn't have dozens of save games. 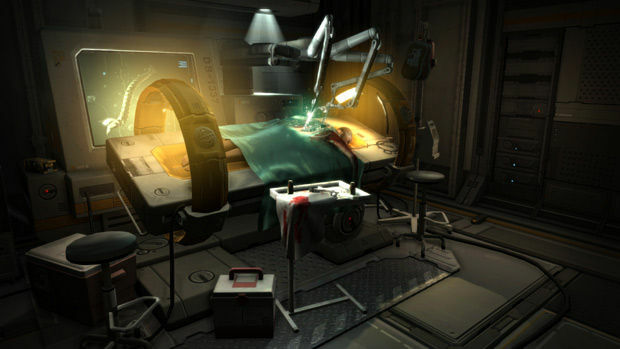 I won't go into the story too much, as part of the fun in Deus Ex is piecing together the overarching storyline, but on the whole The Missing Link fits nicely into the main game's narrative without actually adding anything you can't live without. There are more than a few hints at the world of Human Revolution and the original Deus Ex for the fans that care, but then again, if you played Deus Ex then you already kind of knew how it all ends up anyway. Suffice it to say that some key names make an appearance while skulking in the shadows and hacking computers like a boss. Story and narrative fun aside, The Missing Link focuses on the cargo ship you were a stowaway on in the main game, and the Belltower base the ship is heading towards. Of course, nothing is as it really seems and twists and turns have you corkscrewing your way through about 5-6 hours of gameplay. There's a nice mix of stealth and optional combat to fit the style you feel most comfortable with, so fans will feel right at home. You will be able to respec Jensen quickly enough after starting, which gives you a chance to try some new avenues of approach without having to spend 15 hours of the original game. 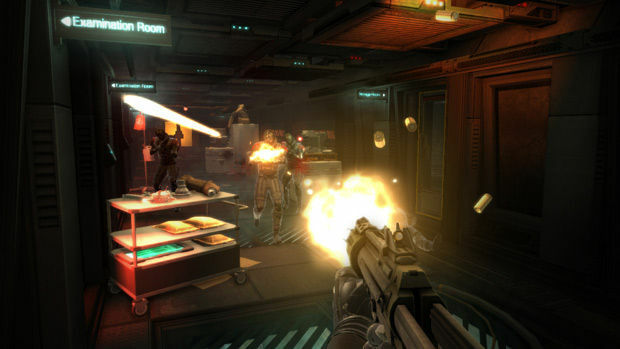 An achievement or trophy is bestowed upon the player who chooses to go through all of it without ever upgrading an augmentation or using a weapon or explosive. Being a whore for these virtual points, I played through it this way and it was more than doable. If you played Human Revolution by sneaking and taking down soldier after soldier, you'll have little trouble adapting to the new environments. Although there is no boss fight of the kind you've seen in the main game, there is a pretty tense final confrontation that will probably get you killed a couple of times if you're going with the no-upgrade stealth route. It's not super hard, but challenging enough to keep you on edge -- just like most of The Missing Link. Because The Missing Link acts as a standalone chapter that takes place within Human Revolution's existing story, any of the choice and consequence you are offered suffers as a result. Some minor decisions early on may give you small benefits later on in the DLC, but the big choices you can make don't make you feel much at all; you already know none of it actually changes anything in the bigger story you've already played and finished. It also means that none of the weapon upgrades, credits, or Praxis kits you'll find impact the main game, and neither does the game really explain why Jensen is suddenly without the gained resources when he arrives in the story after the DLC ends and the main game picks up. To be fair, it would've been really hard to explain how Jensen loses his upgrades and weapons, respecs his augmentations, gains XP, and suddenly appears after The Missing Link's events with the same tools and skills he had before. With the majority of Jensen's adventures being located in the rather large secret Belltower facility, there is some inevitable backtracking. On the upside, there are no loading screens as you go up and down the different levels of the sprawling base. On the downside, there are a couple of security scan sequences to mask the loading of different areas, and sometimes the prospect of going through yet another scan when you know you're going to have to deal with it can elicit a few sighs and grunts. As a standalone chapter, though, it's a solid one. The Missing Link is just one really long side-quest, but it's a good one even though I'll be hard pressed to remember much of it in a few months time, or play it again any time soon. The story and characters are good enough from the spoiled perspective of a Human Revolution player, but don't offer anything that goes beyond the main game's quality. 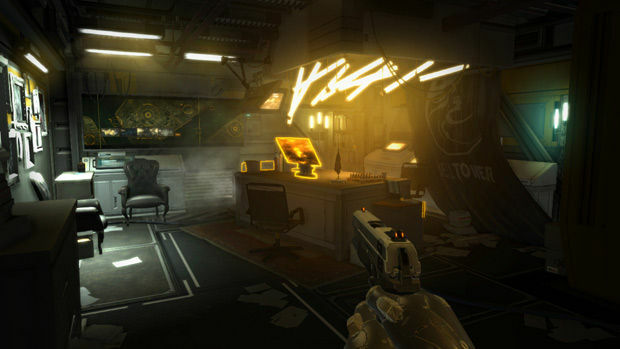 It does offer a good chunk of more Deus Ex: Human Revolution, with some fan service hidden in plain sight here and there, but as DLC goes it's not as fantastic as the experience Lair of the Shadow Broker gave to fans of Mass Effect. And, you know, Shadow Broker and BioShock 2: Minerva's Den weren't $15. Still, this piece of DLC offers a good amount of content for its price, about a fifth to a quarter of Deus Ex: Human Revolution's 20-25 hour playtime for a fourth of the (original) price. The Missing Link is a well-produced piece of DLC with a level of quality that fits right in with the main game both in terms of quality and atmosphere. It's just more Deus Ex: Human Revolution, and there's nothing really wrong with that since the original game was fantastic. 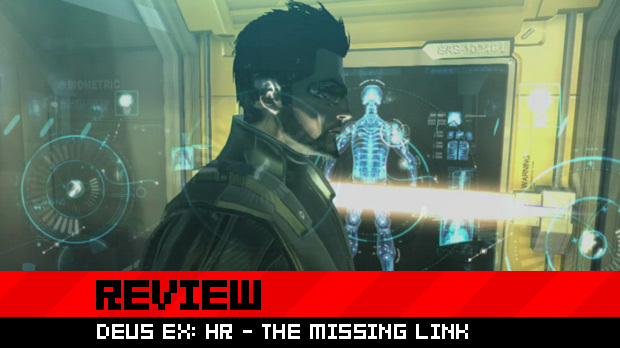 If you want more Deus Ex, The Missing Link delivers in spades but won't blow you away. Yet it doesn't give you any truly orgasmic story or gameplay experiences; it's just more of the same quality game you already played. For more of the same, whether it's a really long extra chapter or not, $15 is a bit on the high side if you ask me, and well above the instant-buy threshold I maintain for myself. Whether or not the extra $5 is going to kill you or not, as a fan you're still going to enjoy what The Missing Link gives you. How could you not? It's more Deus Ex!